haughty princess (Michael) from death by her fiendish fiancee. In a Monkee spoof on fairy tales acted out in pantomime, the Narrator introduces Michael, a cobbler, David, a tailor, Micky, an innkeeper and Peter who is out of work, all living in a town called Avon-On-Calling. Peter is a vagrant, because his concentrations on getting a job are stunted by his admirations for Gwen, a beautiful, yet selfish, conceited and overbearing princess. The other guys try to convince Peter to forget about the princess since she’s out of his league, but Peter declares that he loves her so deeply that he’ll sever his right arm to please her just as Princess Gwen arrives on a carriage which ends up stuck and the mud. Princess Gwen (Michael in drag) calls for help. Peter offers to carry The Princess across the mud but she rudely disdains his suggestion and instead orders him down on the ground so she can honors his spine with a walk across it, followed by her fiancée Harold, a knight and troop of the soldiers, and soon Princess Gwen starts barking orders to get the carriage out of the mud within 10 minutes or she won't marry him and soon they depart. Later at Micky’s Inn, Harold and fellow knight Richard order food are soon served fruit, bread, pig, wooden chairs, wooden benches and studio lights! Then Peter learns that Harold plans to do away with his fiancee and tries to warn Gwen but he is interrupted by Harold and Richard who arrive with leftovers for the Princess. Peter is back on the ground again as Harold once again walks on him. Just as they prepare to leave, the princess tosses Peter a tin locket she was wearing before they leave. Back at Micky’s Inn, Peter tells the others of Harold’s murderous plans. Then he bites down on the locket convinced it's a worthless piece of junk made of tin; suddenly, a fairy is released in a puff of smoke (in curlers because she was having her hair done) declaring she’s The Fairy of The Magic Locket. The guys tells her about Princess Gwen so she decides to help them save her by telling Michael to make shoes that can scale walls, Micky to forge a kitchen knife into a sword that can cut through iron, David to sew a suit of mail and Peter to collect unemployment while his friends are working. She then warns Peter she’ll be killed if he drops, crushes, or loses The Locket, because she lives there. Soon Michael, Micky and David set to work to make all the things required for Peter's armor. Meanwhile, the Princess is locked up in the castle dungeon by Harold’s toady, Richard, just as The Monkees dragged a now suited-armed Peter to the forest to save her. On the way to her rescue, Peter meets Little Red Riding Hood (David), Hansel and Gretel (Micky and David), and Goldilocks (Micky) before arriving at the castle’s gate. There he encounters a fierce Dragon Of The Moat, who decides to let Peter enter rather than fighting him (as he is sick of violence) should he guess a riddle correctly. Peter doesn’t know the answer to the riddle but The Dragon lets him enter anyway and orders the bridge to be lowered. It turns out to be a trap as Peter encounters the deadly Richard. But Peter’s Magic Locket successfully protects him against Richard’s sword and mace and chain, and Richard flees. Then Peter scales the walls of the castle and enters the dungeon to rescue the Princess. However, the ungrateful Princess says she only loaned him the The Locket and demands it back, so Peter hands it over just as Harold and Richard arrive. Peter tries to fight them with his sword but is unable to unsheathe it without The Locket which the Princess adamantly refuses to return, and he is taken prisoner as well. Meanwhile back at Micky's Inn, Micky, Michael and David begin to regret sending Peter to save Princess Gwen alone; suddenly, they recieve a message from the Town Crier: Peter, Peasant of Tork, is slated for execution for tresspassing on Knight Harold's estate! The three then set out in search of the castle in hopes of rescuing Peter. After searching for the castle for three days, Micky suggests they split up, leaving a trail of bread crumbs behind them wherever they go and follow them back. They all take off in different directions and meet the Fairy Tale characters, with Micky encountering Little Red Riding Hood and David, Goldilocks. The trio rendezvous at the castle "they said no man could get in alive! ", where they are at first scared off by The Dragon Of The Moat but later after answering his riddle correctly, they are allowed to enter just in time to stop Peter and Gwen from being shoved over the precipice by Harold and Richard. A wild battle erupts with an army but since both Peter and Harold hate violence they decide to arm wrestle instead. Peter seems to losing so Princess Gwen reluctantly tosses The Magic Locket back to him; he then overpowers Harold, forcing him and Richard surrender. After Harold and Richard have been captured, Princess Gwen thanks Peter and offers to grant him any wish and the others urge him to propose to her. When he does, she refuses his request and whips off his hat, wig and makeup, revealing to be Michael, and declares that he can’t marry anyone, because he’s already married! They all wrap up the episode by giving a brief speech to the audience before singing the Monkees theme and hilariously departing. Michael is interviewed about his role as the princess, and Micky, with Moog synthesizer, sings “Daily Nightly”, in an impressive black-and-white number shot on the bandstand in their pad, while Michael, Peter and David look on. Wardrobe Alert!! In the tag interview sequence of “Fairy Tale” and Episode No. 51, “The Monkee's Paw,” take special notice of The Monkees' threads. These are the same ones they would wear in the teaser and tag sequences of Episode No. 54, “The Monkees In Paris.” That brown suit worn by Michael is probably the same one he wore in Episode No. 55, "The Monkees Mind Their Manor" (without the jacket), and certain scenes in The Monkees' 1968 movie HEAD. The “Daily Nightly” musical sequence is reused in the outset of Episode No. 57, “The Monkees Blow Their Minds.” It is one of three onscreen appearances of The Monkees in black-and-white, following Michael and David's screen tests shown at the outset of Episode No. 10, “Here Come The Monkees” (Original Pilot Film), and the police evidence film of Micky Michael and David "robbing" The Ninth National Bank in No. 34, "The Picture Frame" a.k.a. "The Bank Robbery"), and preceding the "silent movie" sequence seen in the movie HEAD and the "Regional Girl" sequence seen in the 1997 ABC-TV special, Hey Hey It's The Monkees. And the white clothing The Monkees are seen wearing in the “Daily Nightly” number is the same clothing they wore in the “Star Collector” sequence. Trivia Footnote: A color still of The Monkees shot inbetween takes of these numbers was used on the front sleeve of The Monkees' 7th single "D.W. Washburn" b/w "It's Nice To Be With You" (Colgems #1023). A couple of music cues from “Fairy Tale's” medieval underscore are reused in Episode No. 55, “The Monkees Mind Their Manor” (at the beginning of the medieval fair scene and in the fencing scene). Stu Phillips' composed-conducted background music for this and the previous episode, No. 47, "The Monkees Christmas Show", was recorded from 1:30-5:45 p.m. at Western Studio 2 in Hollywood on Tuesday, December 12, 1967. The fictional town Avon-On-Calling (originally called "Avon-On-The-Calling" in "Fairy Tale"'s Screen Gems Storyline) is an affectionate nod to the successful advertising campaign of that renowned perfume manufacturer Avon---the historic "Avon Calling!" ---which was initiated in 1954. At the time of this episode's airing, Avon had just introduced novelty scent bottles. Writer Pete Meyerson and director Jim Frawley previously collaborated on Episode No. 39, "Hillbilly Honeymoon" (a.k.a. "Double Barrell Shotgun Wedding"). Here, Frawley once again does double duty as director as voiceover artist; he provides the voice of The Dragon Of The Moat. This week ABC preempted Cowboy In Africa for a special, The Undersea World Of Cousteau: Sharks, which came in second in The Nielsens with a 21.4 rating/30.4 share (11,980,000), while CBS mainstay Gunsmoke won its timeslot with a 28 rating/40.5 share (15,680,000 viewers) and The Monkees on NBC finished a close third. For the first time this season, the show diverts from its normal sitcom format to diplay a more surreal, off-beat flair. This led to several future second-season segments of The Monkees on NBC which also serve in this vein: the next episode, "The Monkees Watch Their Feet", No. 50, "The Monstrous Monkee Mash", No. 51, "The Monkee's Paw", No. 52, "The Devil And Peter Tork" and No. 58, "Mijacogeo" (a.k.a. "The Frodis Caper"). Peter Tork is the only Monkee in this episode not to portray multiple characters, as he is the hero and focal point of the story. The case was the same for David in Episode No. 6, “The Success Story”, and for Michael in No. 12, “I've Got A Little Song Here”. Michael Nesmith is the latest Monkee to dress in drag on The Monkees; this was the only such occurrence on the series. Other episodes which feature cross-dressing Monkees are No. 2, “Monkee See, Monkee Die” (David), No. 3, “Monkee Versus Machine” (David, Micky and Peter), No. 9, “The Chaperone” (Micky), No. 13, “One Man Shy” (a.k.a. "Peter And The Debutante") (David), No. 14, “Dance, Monkee, Dance” (Peter and Micky), No. 34, "The Picture Frame" a.k.a. "The Bank Robbery") (Micky), No. 39, "Hillbilly Honeymoon" a.k.a. "Double Barrell Shotgun Wedding") (Micky again), and No. 56, "Some Like It Lukewarm" (a.k.a. "The Band Contest") (David). Other Monkees to appear in drag in “Fairy Tale” are Micky Dolenz and David Jones, as Goldilocks and Little Red Riding Hood/Gretel, respectively; notice that David wears the exact same red wig for both his guises as Little Red Riding Hood and Gretel..."very Gretel," indeed! Trivia Footnote: Michael Nesmith would not dress in drag onscreen again until the 1980s, which found him cross-dressing in a short scene at a restaurant in Television Parts and Dr. Duck's All-Purpose Super Secret Sauce. Number of times the back of Peter, Peasant Of Tork, is walked/stepped on: 6. Micky is seen wearing Converse All-Star sneakers. He also wears them in Episode No. 42, "The Wild Monkees", No. 43, "A Coffin Too Frequent", No. 45, "The Monkees In Texas", and No. 46, "The Monkees On The Wheel". In No. 47, "The Monkees Christmas Show", No. 50, "The Monstrous Monkee Mash", No. 51, "The Monkee's Paw", and No. 58, "Mijacogeo" (a.k.a. "The Frodis Caper"), he is seen wearing moccasins. The impenetrable grey suit of chain mail which David makes for Peter in “Fairy Tale,” is reused in Episode No. 55, “The Monkees Mind Their Manor,” in the scene where David is challenged by Sir Twiggly Toppin-Middlebottom (Bernard Fox, who, coincidentally, wears the black suit of maille worn by Murray Roman [Harold] in “Fairy Tale”) to do battle by lance, and in Episode No. 56, "Some Like It Lukewarm" (a.k.a. "The Band Contest"), wherein it is donned by drag king Daphne/William McCochrane (Deanna Martin), leader of The West Minstrel Abbies. In the scene where David sews the impenetrable grey suit of maille for Peter on a medieval sewing machine, a sound effect emits from the machine which was prevously heard in Episode No. 17, “The Case Of The Missing Monkee”. The final minutes of this rather off-kilter segment of The Monkees features the first of Michael Nesmith's hilarious end-of-show wrap-ups; others will be in No. 51, "The Monkee's Paw", and No. 55, "The Monkees Mind Their Manor". Also, the closing to this episode and No. 51, "The Monkee's Paw", features The Monkees misnaming each other. Peter Tork demonstrates his superb ability to accentuate the letter "P" in this episode ("An im-p-enetrable dragon! "), something which he first displayed in "Peter Percival Patterson's Pet Pig Porky," a track on Pisces, Aquarius, Capricorn, & Jones, LTD.. He gives off the "P" again in Episode No. 51, "The Monkee's Paw", in the scene where he and David try to show a voiceless Micky how to say "pencil." In the fight scene where The Monkees take on Harold and Richard, Michael invariably shouts out fight words ("Bam! Boffo! And another hit in the armor!! "), replicating the fight scenes on Batman; another Batgimmick lampooned here is the 90 degree-shot of Peter walking up the castle wall, replicating the popular Batclimb. After Harold and Richard surrender, Micky, Michael and David break into a hilarious rendition of the Main Title theme from The Adventures of Robin Hood (CBS, 1955-60). Michael Nesmith introduces his catchphrase, "Nosiree, bob! ", in this episode. He repeats it in Episode No. 51, "The Monkee's Paw". The white attire in which The Monkees are clad in the “Daily Nightly” musical number is the same clothing they wear in the “Star Collector” sequence. This is Michael Nesmith's and Peter Tork's favorite Monkees episode. This episode aired on the 33rd birthday of Elvis Presley, another RCA recording star whose sideburns Michael Nesmith patterned loosely after. A full year after this episode ran firstrun on NBC, Ami Bluebell Dolenz, Micky's daughter, was born. This is the only Monkees episode which sees David Jones referring to Michael Nesmith as "Michael." 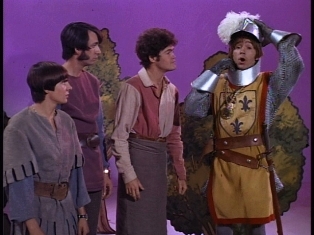 The plot of “Fairy Tale” in which a Monkee saves a princess from certain death recalls that of The Monkees' series premiere, “The Royal Flush”. Monkee stand-in David Price has an unbilled role as Horseman #2. Richard Klein (who is billed, as Horseman #1), another Monkee stand-in, made many episode appearances but was given screen credit only twice on the show; for this and Episode No. 58, "Mijacogeo" (a.k.a. "The Frodis Caper"), 10 episodes later. The late comic Murray Roman (Harold) won an Emmy for his written work for The Smothers Brothers Comedy Hour (CBS, 1967-69), one of whose stars will be seen in a future Monkees segment: the late Pat Paulsen, who plays The Secretary for the Department of UFO Information in the next episode, "The Monkees Watch Their Feet", and whose writing staff will retain Monkees alumni Gerald Gardner and Dee Caruso. Roman previously appeared with Monkee guest alum George Furth (“One Man Shy” [a.k.a. "Peter And The Debutante"], "A Coffin Too Frequent") in a November 2-3, 1966 episode of Batman (ABC, 1966-68), "Hizzonner The Penguin/Dizzonner The Penguin" (#9719). Regis "Rege" Cordic (Narrator/Town Crier) later appeared with Monkee guest Ron Masak ("The Monstrous Monkee Mash") in the March 24, 1968 episode of The Flying Nun (ABC, 1967-70), "When There's A Will," which aired one day before the telecast of The Monkees' final firstrun episode, "Mijacogeo" (a.k.a. "The Frodis Caper"), on NBC. Cordic later appeared in a December 19, 1969 episode of Get Smart (NBC, 1965-70), "Ice Station Siegfried," with Monkee guest alumnus Cliff Norton ("The Picture Frame" [a.k.a. "The Bank Robbery"]). The late Diane Shalet (Fairy Of The Locket) played Eula Pendleton on The Waltons (CBS, 1972-81) and Ms. Hawkins on Matlock (NBC, 1986-95). Shalet was also an accomplished writer and had had some of her work published in short stories anthologies. She was a highly regarded acting teacher and UCLA asked her to teach in the UCLA Extension's spring semester. Shalet passed away on February 23, 2006—her 72nd birthday.